Our 4-Day Tour from Marrakech to Fes is like no other. With this 4 day tour you get time to really enjoy the sights and the culture unlike a 2 or 3 day tour. 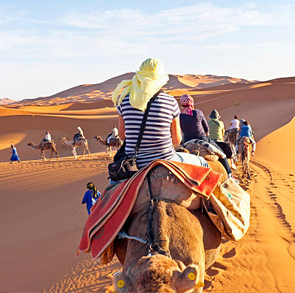 This tour offers exceptional value for money and a very immersive experience into the Moroccan culture. 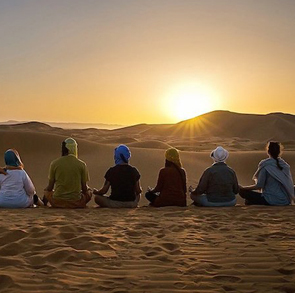 When visiting Morocco you don’t want to miss out on this amazing 4-day desert tour from Marrakech. The first day of the tour you will depart from Marrakech before 8 am on a 14 seater minibus. Your final destination for this day will be Zagora. This bus ride will take you through the stunning High Atlas Mountains and through Tizi n’Tichka.We will visit the Kasbah of Ait Ben Haddou where you are admitted for free. From here the journey continues to Ouarzazate – the Hollywood of Morocco.The next move will be the trip to Zagora through the scenic yet winding valley known as Draa Valley. Zagora is a mountainous city in the south-eastern section. 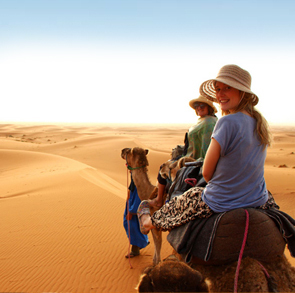 Once here you will have the chance to unwind a bit before enjoying an exploratory camel back ride across the dunes until sunset.After your sunset camel ride, you can enjoy a bonfire at the Berber camp where you will be spending the night. There will be nightly entertainment in the form of a bonfire and a music show. There will also be a traditional Berber dinner before you retire to your tent for the night. If you would like to sleep under the stars here you are welcome to do so. On the second day of this 4-day tour you will travel from Zagora to Dades Gorge through Ouarzazate. You will awake prior to sunrise to watch the beautiful sunrise then will be served a traditional Berber breakfast. After breakfast, your day will start by travelling back to Zagora by camel back ride.From Zagora you will travel back to Ouarzazate. At Ouarzazate there will be a vehicle change before continuing on to the rest of your tour. Your trip to Dades Gorge will continue after lunch. Upon arrival in Dades Gorge, you will check into a comfortable guest house where you will have your evening meal and will spend the night. You will awake for Day 3 here and have breakfast prior to embarking on the next leg of your Morocco Desert tour. 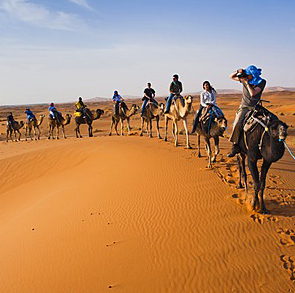 On day 4 you will wrap up the tour by travelling from Merzouga to Fes. You will awake early so you can enjoy an Erg Chebbi camel back ride once more. You will then have the opportunity to have breakfast at a Merzouga hotel and prepare to begin your journey to Fes. There will be multiple stops on your 7-hour journey where you will have the option to take photos and have lunch. Your journey will have you arriving in Fes at around 16:00 or 17:00.